One of my new year's plans is to blog much more this year than last year. Last year was so chaotic getting our house and lives ready for our new little baby. I'd like to start this year of blogging with some giving. My friend Tara of the tiny hummingbird made Amelia this beautiful baby quilt. She is a talented quilter and I love the simple lines of her quilts. They really showcase the beauty of the fabric! 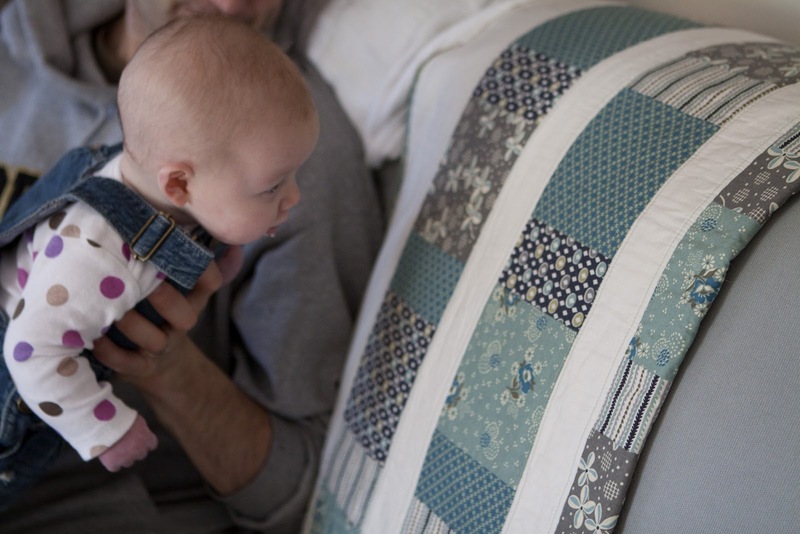 If you click on this link: a quilt for Baby Mac, you can see her post about making the quilt! Today Amelia was staring at the patterns (she loves patterns - I take this as a good sign!!). My husband encouraged me to take a picture to show Tara. 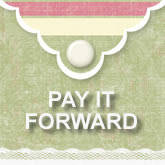 "Pay it forward" is the idea that random acts of kindness are given without expecting anything in return. It's passing on a kindness hoping that your recipients will do the same, and forming a never-ending chain of goodwill , that's what this is about. But it isn't only kindness, it is also a means to connect with our fellow crafters, to network, if you will, and to share our enjoyment of crafting/sewing instead of just keeping it to ourselves or where only friends and family get to see it. This is how it works: You'll have to comment on this post and the first three people who comment will receive a handmade gift from me within the next few months. But those three people will also have to post the idea on their blog and commit to making a gift for the first three people who comment on their blog and so on and so forth. SO, the first three people to comment here will get something handmade by me, but you have to do this on your blog as well. I'll be reading your blog to figure out what to make you and to make sure that you have posted about your Pay it Forward! I love this idea! What a fun way to give to others! It is no wonder Amelia is staring at that quilt - I would too, it's beautiful! Oh this is such a fabulous idea! I'd LOVE to take part, and this goes with one of my New Year's resolutions! Awesome!